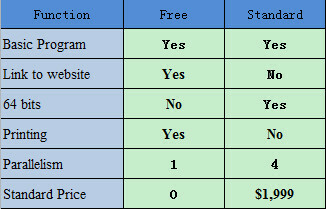 1.Raqsoft may change the license and price policy without informing the users in advance. But downloaded and purchased packages will not be affected. (1) Raqsoft website will be linked mandatorily each time when IDE gets started; If fails to link the website,the program will not start up. (2) No commercial advertisement in IDE at present, but it may be added in the future without notification. 5. Free edition doesn’t require registration code, it worksafter installation. 6. Standard edition has to be paid to get registration code, and the listedpriceis for 4parallelel threads; Purchase or inquiry other parallelisms or purchase in bulk, please email to sales@raqsoft.com.